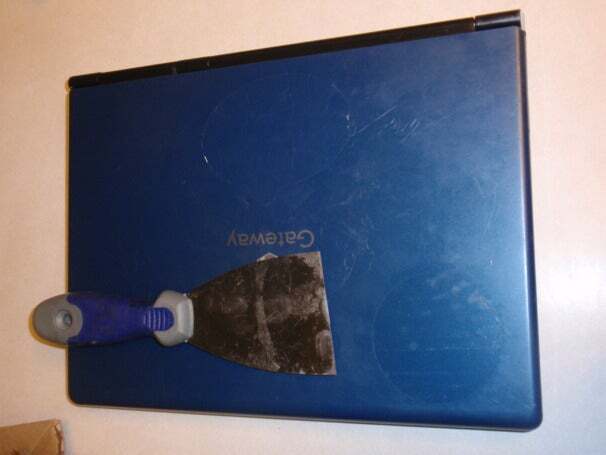 How Do I Clean My Laptop? It looks almost brand new, doesn't it? (OK, ignore the missing key; that's a repair for another day.) 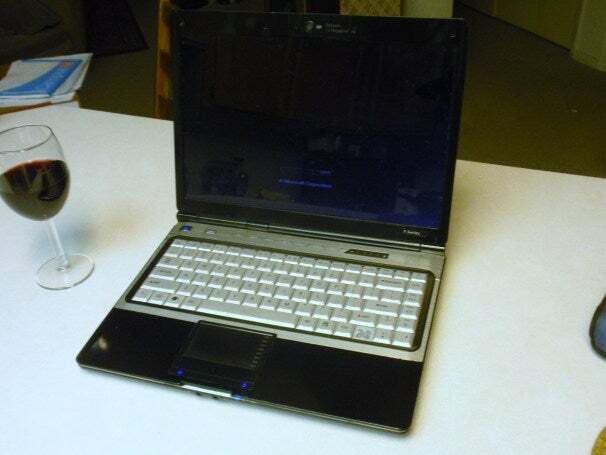 Using cheap and simple materials that you can find in any hardware store, you too can repair chips and repaint your laptop to make it look practically brand new. To get started, all you need are the appropriate tools and an afternoon! Prices may vary depending on where you shop. 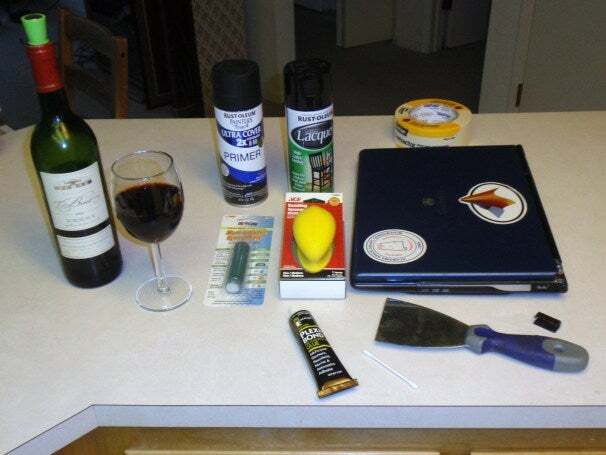 I picked up almost all of these supplies at my local Ace Hardware (the wine excluded), but you could probably get all of them at Walmart. Also, you only use a small portion of each of these supplies, so you may have just spent $56.17 on supplies but the reality is that you could repair and paint a half dozen (or therabouts) laptops with these supplies. In other words, you'll have plenty left over for other exciting projects. The first thing you'll want to do is prepare your supplies and pour yourself a glass of wine (drink responsibly!). Usually you want to do an appropriate pairing with your meal; I chose a wine, Briot Bordeaux, that goes with sweet food, seeing how totally sweet this repair is. In case you're wondering, yes, I dropped this thing on the pavement. Multiple times. 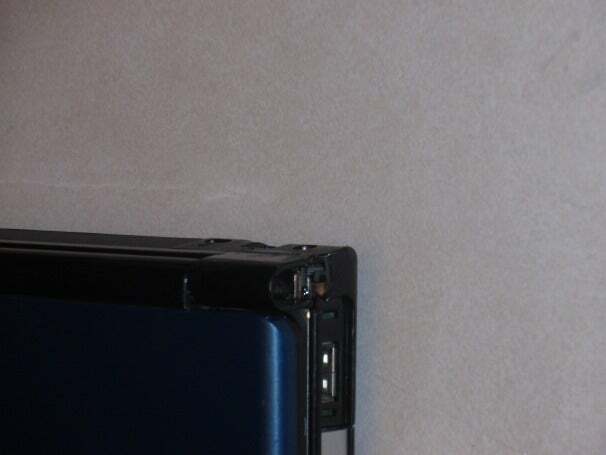 To fix this, take your sanding sponge and rough up the edges of the broken-off plastic chip and the edges on the laptop. 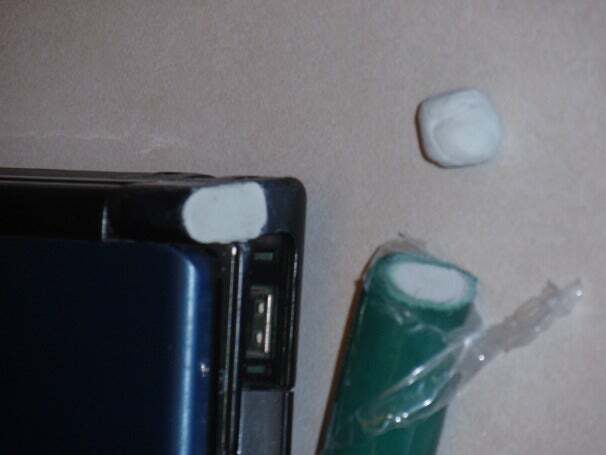 Then take the Plexi-Bond, a good all-purpose adhesive, and coat the edges of the chip using a cotton swab. 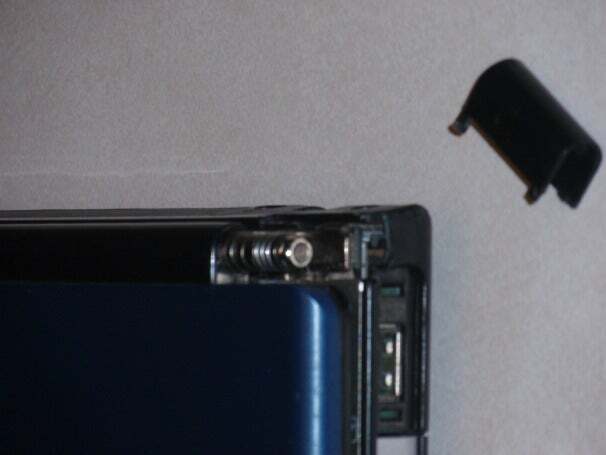 Push the chip back into place on the laptop. As you can see, there is still a missing chunk of plastic that I didn't manage to find. Let this dry for whatever time is designated on the package--in my case. it dried hard in an hour and finished curing in 24 hours. Since I wanted to knock this entire project out in an afternoon (and because I'm lazy), I decided that an hour was enough, and that it was time to get on with the show. 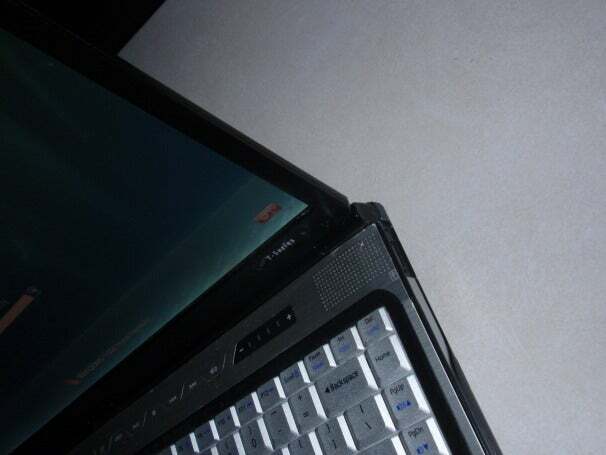 In this next step you'll want to remove any logos that you might have on your laptop either for aesthetics, advertising purposes, or to simply cover up some scratches. I used a putty knife to scrape them off. There was some residue so I really had to apply some pressure to get it off. If there is still some residue then you can apply some acetone to remove it and if that doesn't do the trick then pick up some Methyl Ethyl Ketone, a strong industrial solvent, but be careful; this stuff will make you nauseous if you inhale it. 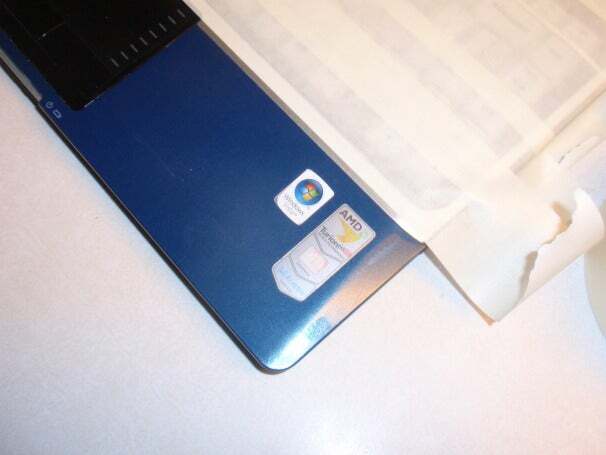 Don't forget that there might be some logos on the inside of your laptop; you can either remove these or cover them with tape. I chose to remove them. 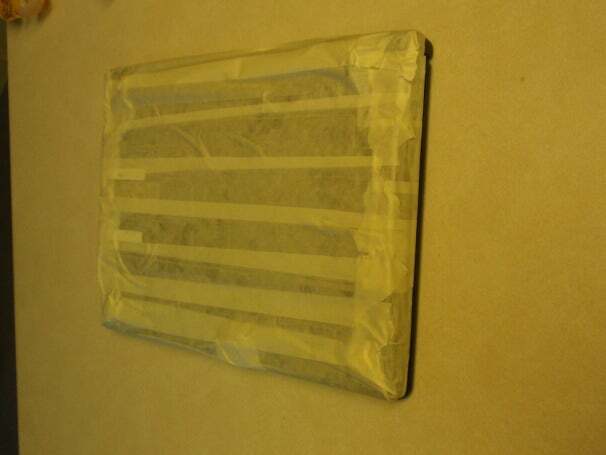 Now it's time to tape up the laptop. You're going to want to cover any open areas and anything else that you don't want painted. 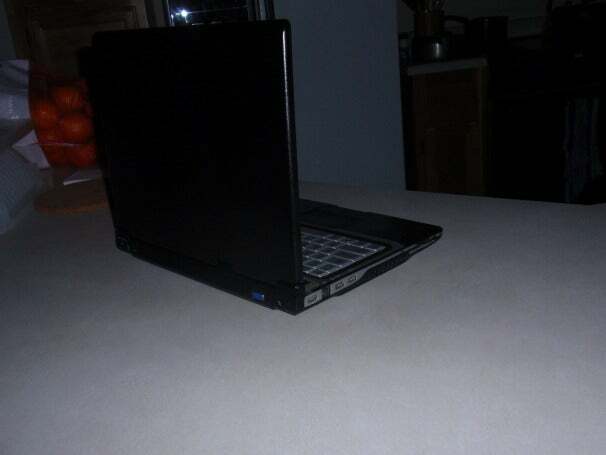 I covered every vent, the entire underside of the laptop, the screen, the touchpad, lights, and so forth. Oh, and don't forget to sand the epoxy putty that you installed. Depending on where you installed it on your machine you'll want to shape it so that it looks the least out of place. Try and get it to look like the original piece. This step isn't absolutely necessary but I highly recommend it. 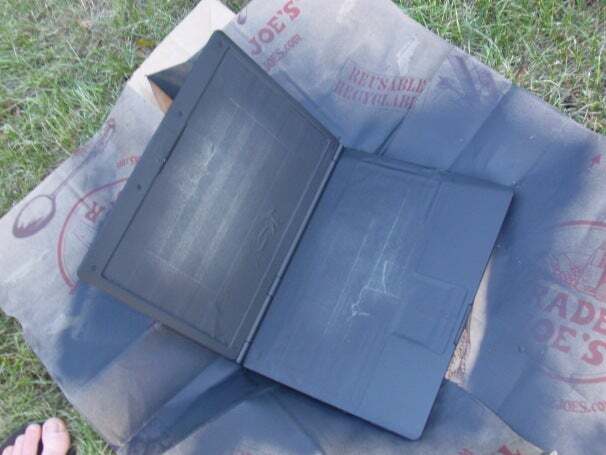 Now that your laptop is rough you'll want to apply a coat or two of primer. Primer helps your next layer of paint adhere to the surface. You'll also want to get a primer that's the same color as your top coat color (and I'm not talking about a a clear protective coating, I'm talking about that shiny black or automotive color that you want your laptop to look like), this will ensure that if your top coat is scratched then you won't have some obscure color like pink showing through. If anything is still going to break, this is the moment you'll find out. So now's a good time to take a short break--feel free to take a sip of Bordeaux and listen to some smooth jazz before proceeding. You're almost finished! 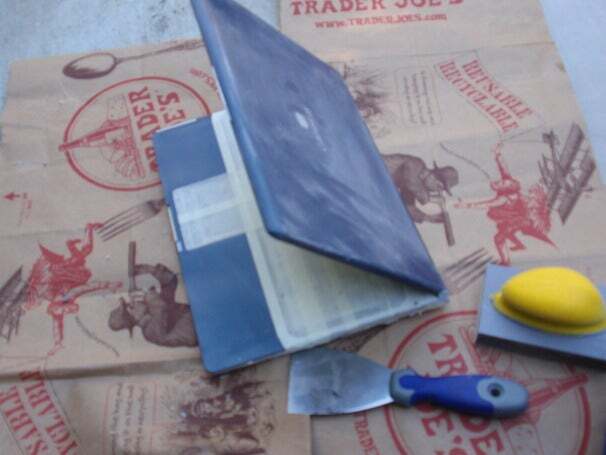 Now that your primer is dry to the touch, shake your can of topcoat vigorously, and give your laptop a coat all around. I did the front and back at the same time; the paint won't drip if you apply a light coat. 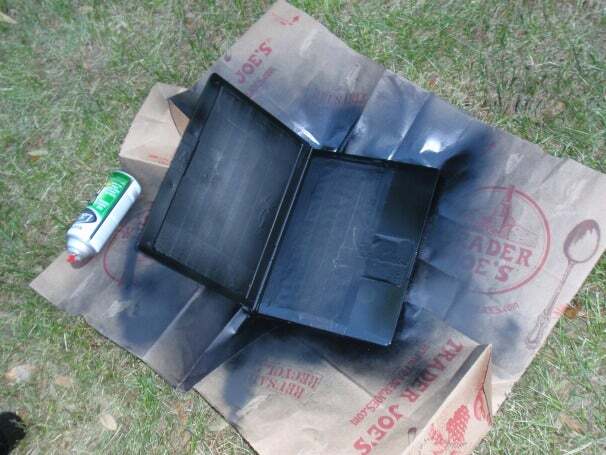 Let the paint dry for about ten minutes and then apply another coat. I did this about three or four times until it had a nice shiny finish. Unfortunately, on one of those coats I held the spray bottle too close to the back of the laptop and I got a very unpleasant drip. If this happens, let the paint dry until you can touch it without it smearing and then sand the area smooth with the sanding sponge. Then reaply your topcoat. 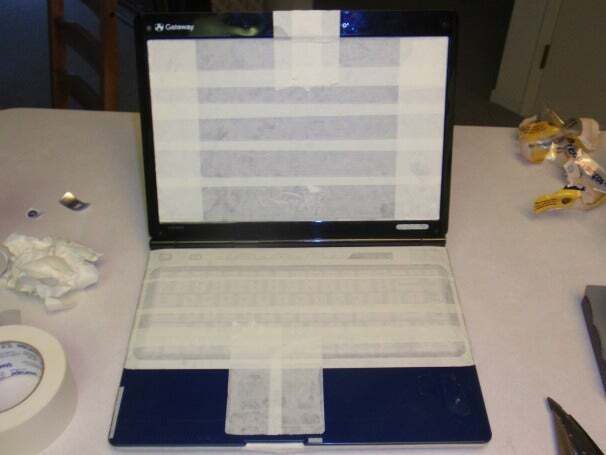 I suggest that you let your laptop dry for a few hours before peeling the tape off. 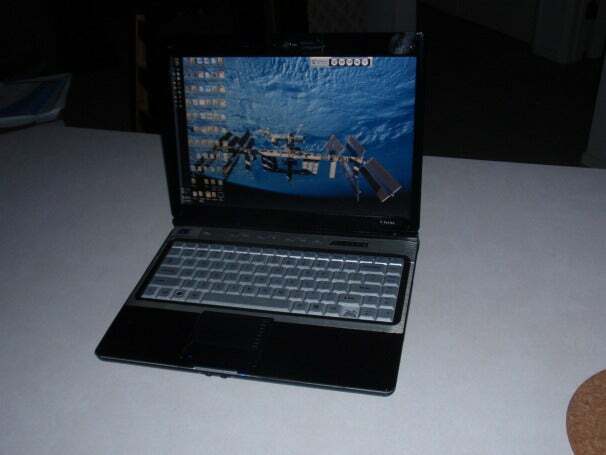 If you want, you can also appy a protective clear coat to help seal and protect your laptop. Depending on the topcoat that you chose this may not be necessary; I did not apply a clear coat. 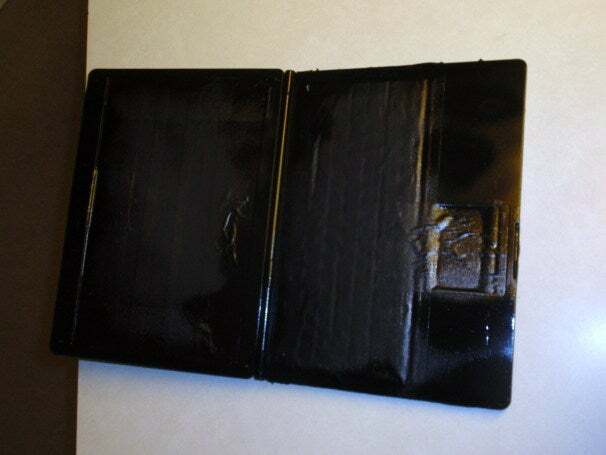 Now that the paint has dried you can begin peeling off the tape. Do this very slowly so that you don't accidently pull up any paint. 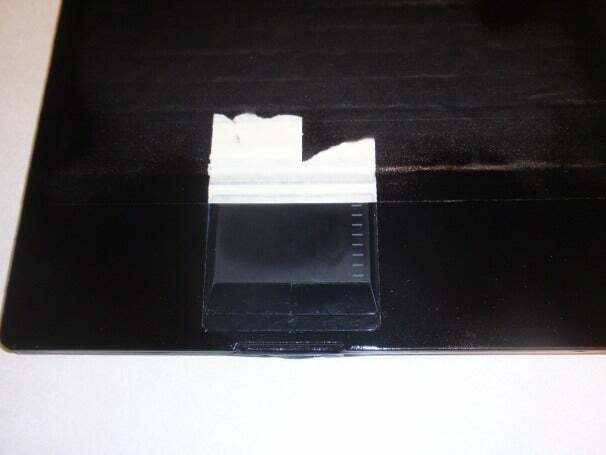 You can use a razor blade to help pull up the edges of the tape if you have any problems. I also found that the contractors' masking tape left absolutely no noticeable residue on my laptop--not even on the vulnerable screen. It's now time to conclude this and see if everything that we worked for has worked without breaking anything. Again, take a swig of wine and brace yourself for the worst. 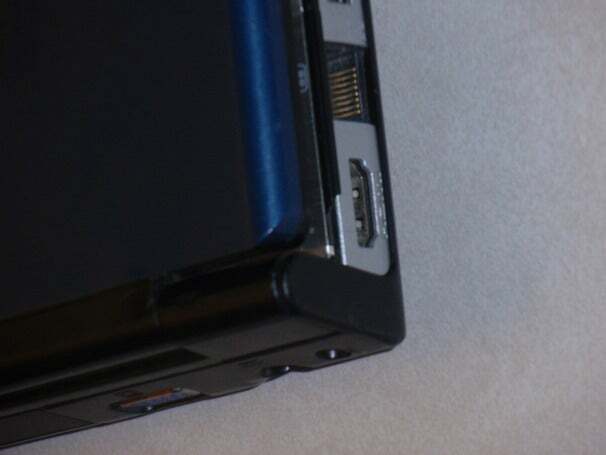 Put in the battery and hit power. VIOLA! It works! The moment that you see "Microsoft Corporation" or whatever other thing your laptop does when it's turning on then you know that it's time to celebrate. Houston, we have completed the mission (and yes, that's my adorable rabbit-eating dog, Janice, in the pic). Follow James Mulroy on Twitter and on StumbleUpon to get the latest in microbe , dinosaur , and death ray news . 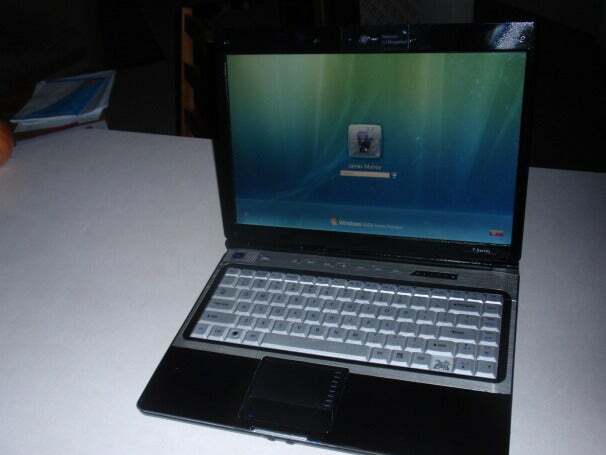 Having problems with your laptop? This collection of how-to's could just help. 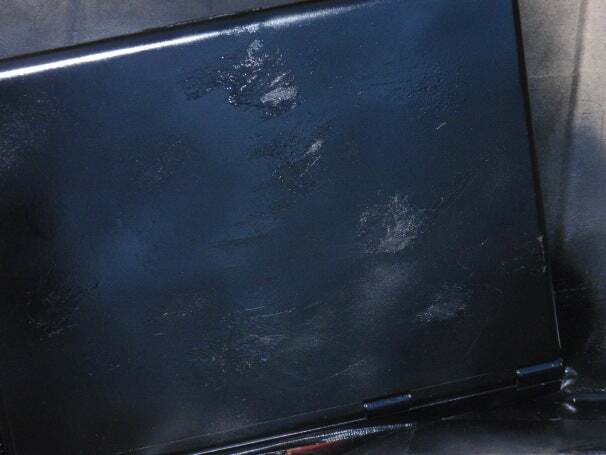 Does your laptop look like you dropped it on the pavement? Fix it up with these simple steps. Sluggish system? Check to see how much RAM you have. 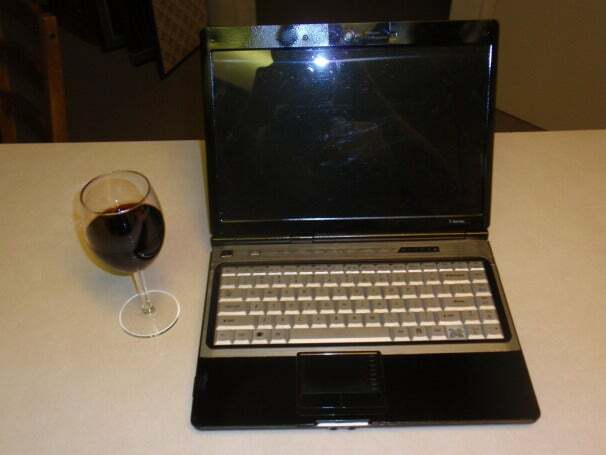 Older laptops often don't have enough.